Kevin C. Maki, principal investigator and a research scientist with Biofortis Clinical Research, explains that a breakfast rich in protein helps women control their appetite and avoid overeating throughout the day. For their study, adult women were placed in one of three groups. They were given either a high protein breakfast, a high carbohydrate breakfast, or no breakfast at all. Both breakfast meals contained 300 calories and similar quantities of fat and fiber, but the protein rich breakfast also contained 30 to 39 grams of protein. After breakfast, the participants answered a questionnaire about their appetites before breakfast and every 30 minutes between breakfast and lunch. For lunch, the volunteers were all given a meal of tortellini and sauce and were asked to eat until they felt comfortably full. Compared to the participants who ate the low protein breakfast or skipped breakfast, the participants who ate the protein-rich breakfast had improved appetite ratings throughout the morning and also ate fewer calories at lunch. Similar results were seen in another study that was published in the American Journal of Clinical Nutrition. Heather Leidy, the assistant professor in the Department of Nutrition and Exercise Physiology, wanted to investigate young people who are the biggest culprits of skipping breakfast. She is one of the first to assess the impact of breakfast on daily appetite and evening snacking in adolescents and teens. Statistics shows up to 60 percent of American young people habitually skip breakfast, despite it being the most important meal of the day. Sample size for the study was small. 20 overweight adolescent females between the ages 18 and 20 were asked to either skip breakfast, eat a high protein breakfast consisting of eggs and lean beef, or eat a normal-protein breakfast of cereal. All the breakfast meals consisted of 350 calories and matched for dietary fat, fiber, sugar, and energy density, but the high protein breakfast also contained 35 grams of protein. After breakfast, participants were also asked to finish questionnaires and provide blood samples throughout the day. Prior to dinner, a brain scan or MRI was used to track brain signals that influence eating behavior. Those who ate the protein-rich breakfast reduced their evening snacking on junk food when compared to the group who skipped breakfast and the group who ate the cereal breakfast. Moreover; results from the MRI brain scans showed a reduction in brain activity that is responsible for controlling food cravings. The high-protein group felt full and more satiated. The researchers concluded that protein-rich breakfasts are an effective strategy to prevent overeating. If you normally skip breakfast, make a conscious effort to change this habit. Breakfast skipping has been strongly associated with unhealthy snacking, overeating at night, weight gain and obesity. Give your body 3 full days to acclimate to eating early in the day. 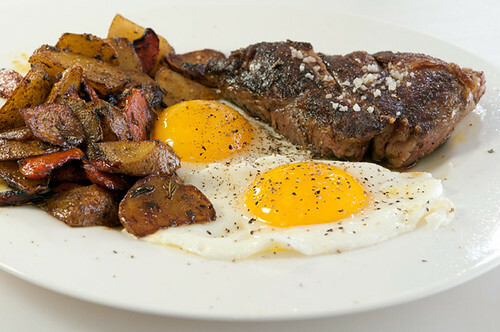 High protein breakfasts include lean steak and eggs, vegetable omelets, sausage and vegetables, and plain greek yogurt topped with nuts and cinnamon. Incorporating a protein-rich breakfast into your daily diet can be a simple strategy for people to feel less hungry and become less prone to snacking.